The 5th building in the world to meet the Living Building Challenge. 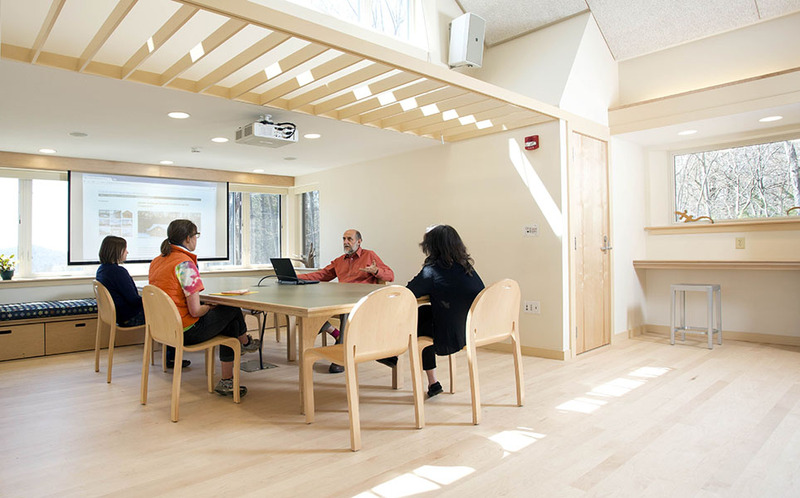 The Bechtel Classroom is a new 2,500 sf single-story wood-framed educational building, which acts as a portal to the surrounding 233 acre forest and pasture property. The building is set into the sloping meadow below a small rise in an area used as a stone dump by generations of farmers. 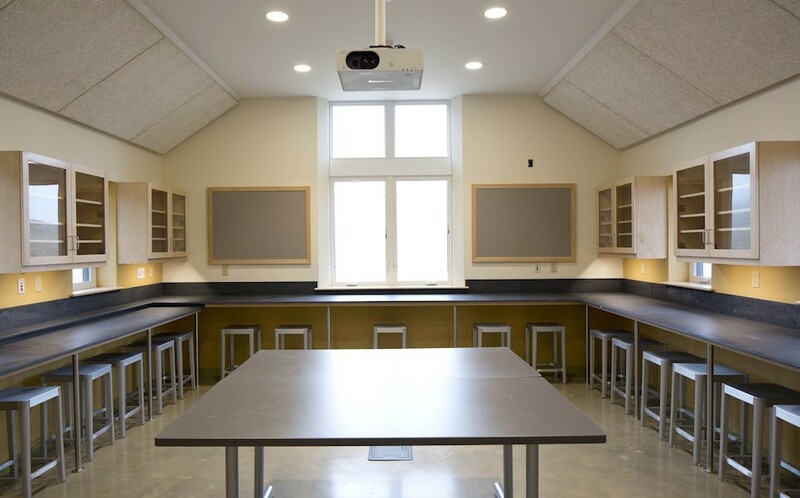 Bechtel encloses two major spaces – a classroom for biological and earth sciences, and a seminar space for humanities seminars and larger group gatherings. 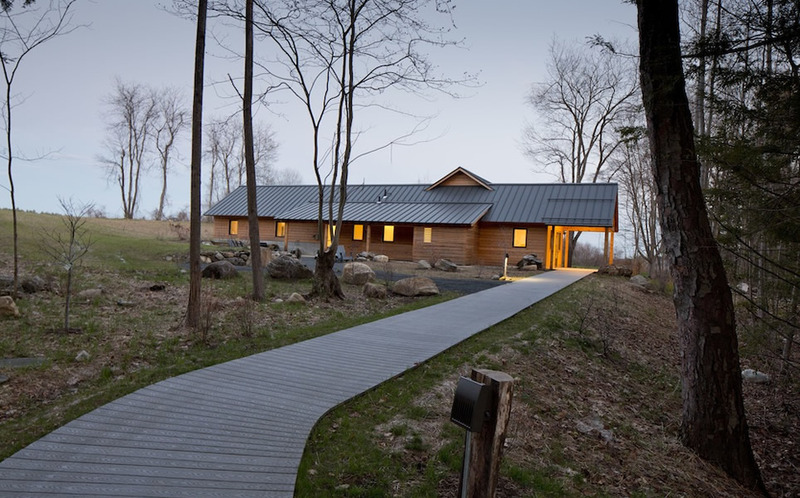 C&H wanted the Bechtel Environmental Classroom to be a “building-in-nature” – a structure of human scale and intimacy reflected in the manner in which this small building has been tucked into its folding, natural landscape. 1. Provide an “emotionally rich and dramatic” classroom experience. 2. Provide visibility to the outdoors – not specifically to “grand views”, but to the various aspects of the pastoral landscape in which the building is located. 3. 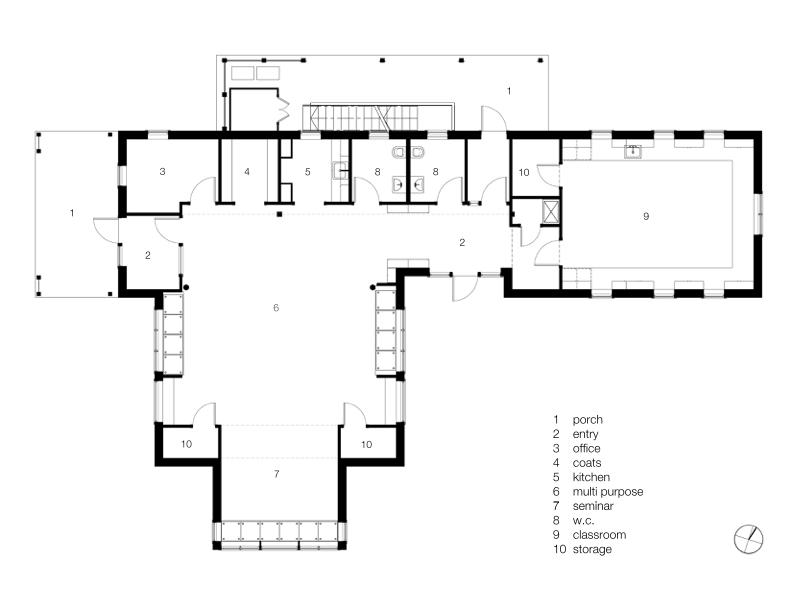 To be capable of accommodating/ supporting multiple groups simultaneously – within, outside, and beyond the building. 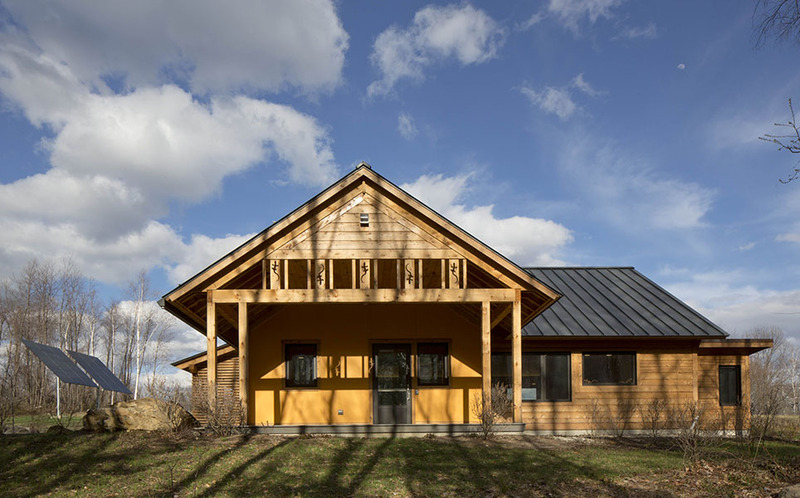 The building is clad in a salvaged cedar wood that is not painted, but rather clear finished with a tree fruit sourced natural preservative penetrating oil so that the natural quality (color, grain texture) of the wood is retained. The siding is applied horizontally to accentuate the low profile already established by pushing the eastern end of building into the slope. The siding planking is deliberately 7” wide with a pronounced “ship-lap” that is reminiscent of a rough vernacular. The building, by these means, establishes an overwhelming natural presence. Tree and columnar supports: as with many of our projects, we have included site-harvested trees in their natural form as elements in the building. The principal interior space is framed by two modest-size trees that were taken from the meadow edge, a growth location that produced their intensive lop-sided branching patterns that we have put to good advantage inside. Amphibian motifs: Working with the College faculty and students, and ultimately using their CNC machine, we cut profiles of the salamander, that lives along the stream and wetland buffer adjacent to the building, in the western gable-end. Transitional spaces: Because the building is accessed only on foot, the transition from the world of the automobile to the pedestrian, more natural world of the building is heightened and lengthened. Because transitions happen on foot over four hundred yards, a variety of new transitional spaces can be created. Natural light: Many who enter the building remark upon the enchanting quality of light and view from the principal space. 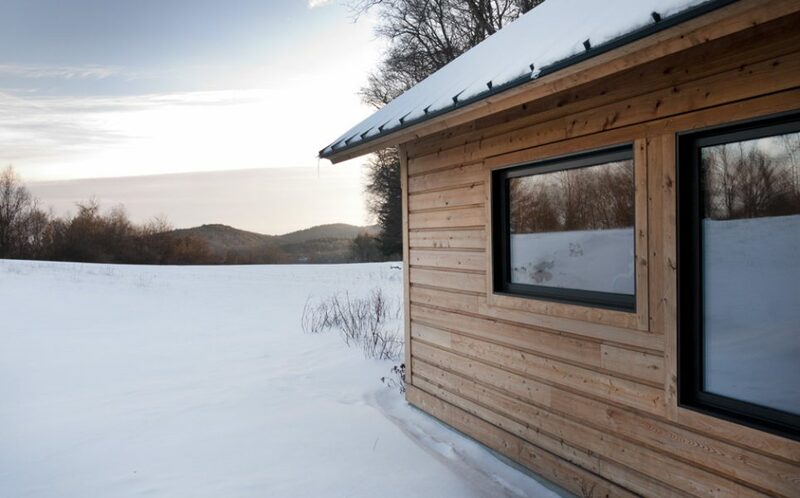 The window sizes and locations have been designed with equal emphasis on producing vitalizing sunlighting, functional daylighting, and visual connecting to views of the distant hills and achieving a glimpse of the far off Holyoke Range — balanced with the need to achieve a very high standard of thermal performance. 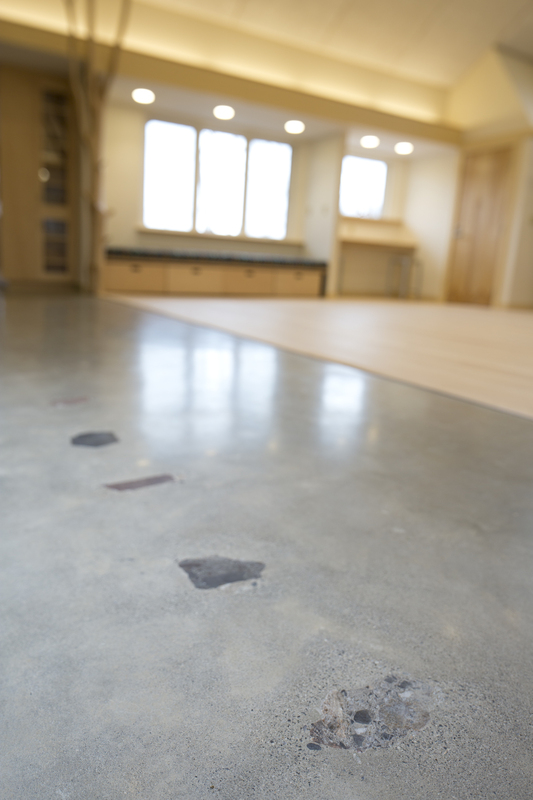 We had settled early on a polished concrete floor for the bulk of the facility. The possibility of setting a sequence of rock samples representing the regional geology evolved gradually, but with the cooperation of the College’s Dept. of Geology 19 fist-sized rock sample were acquired and set into the wet concrete, then ground and polished with the floor finishing operation. The rock samples are carefully located on a “timeline” with the most recent just inside the west doorway and the most ancient in the Classroom space. The others are strung along this timeline with their locations being exactly proportional to their age. The “Rocks-of-Ages” sequence is a small but enduring connection that the building now retains to the regional geology. 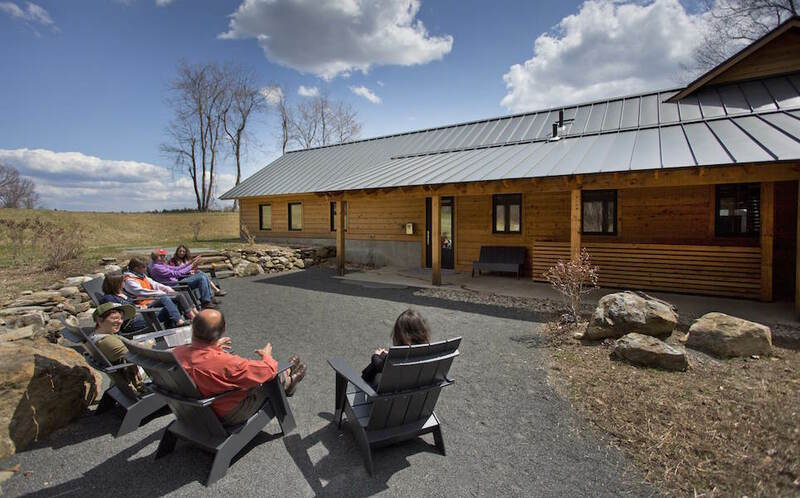 From the outset, C&H felt that this project was well-suited to respond to the International Living Future Institute’s Living Building Challenge. 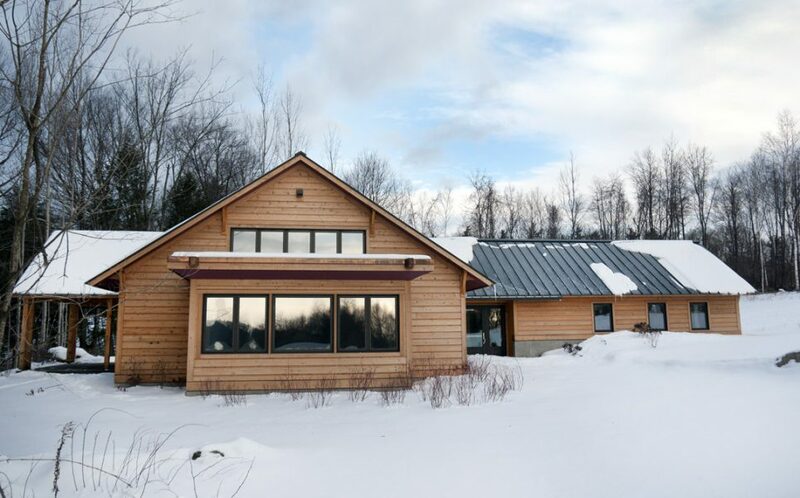 The Living Building Challenge is a considerable step above LEED Platinum. It is the very highest bar of environmental performance – essentially requiring (among other things) that all energy, water, and nutrient flows are managed within the building and site boundaries. This building achieves appropriate sourcing and responsible industry through the use of products and processes that are respectful to all forms of life over time. The lumber comes from locally and sustainably managed forests. All lighting, communication, and control products, were appropriately sourced including recessed LEDs and indirect fluorescent light fixtures. No harmful materials or toxic chemicals from the Red List were used in the building. For example, instead of the use of PVC piping, alternatives such as recycled and recyclable HDPE were used. To account for the embodied carbon footprint from the building’s construction the College paid a one-time carbon offset. 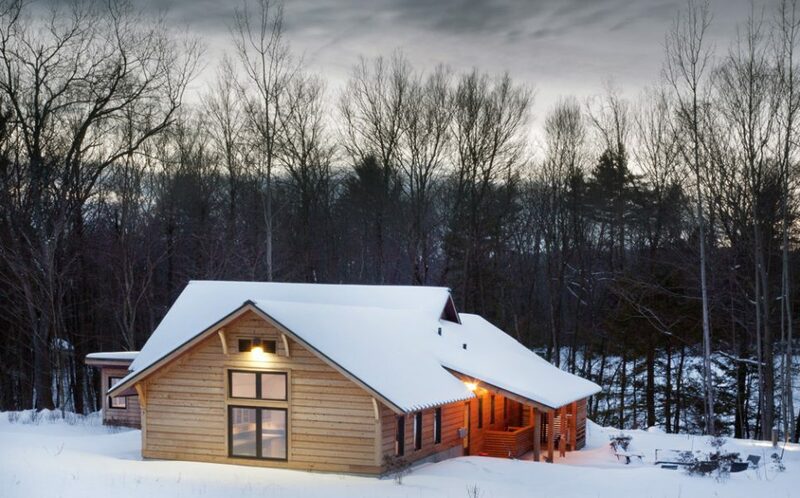 All Living Buildings must be certified after at least one year of operation, to prove Net Zero status. 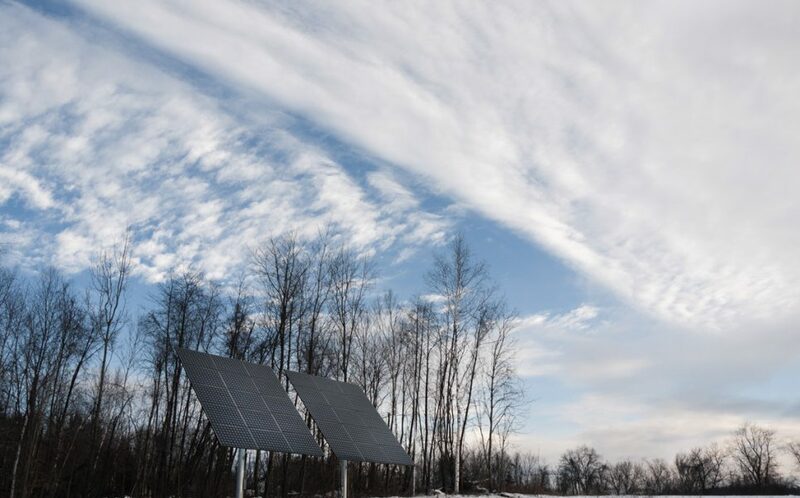 The Bechtel Environmental Center achieved this qualification in 2014.